The emirate’s capital city sits on a small island filled with skyscrapers, with wide, tree-lined avenues punctuated by lush, green public spaces. Careful urban planning makes Abu Dhabi City (a prime area) lovelier than Dubai, its office and residential buildings, malls and hotels surrounded by the refreshing blue hues of the sea and sky. The rich variety of nationalities who have made the city their home have brought forth an impressive number of dining options, and it’s been said that one can dine in a different restaurant here for each day of the year. 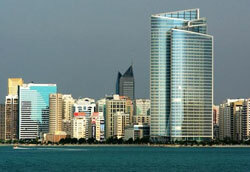 The growth of Abu Dhabi City enabled the spread of economic benefits across the emirate. Its expanding community of foreigners also made the city truly cosmopolitan, with a society that has encouraged relaxed relationships among different cultures and religious traditions. To offer an idea of life here before oil changed the emirate’s fortunes, the Heritage Village features mud hut replicas, as well as traditional crafts. One of the oldest landmarks here is the White Fort, where the Cultural Foundation holds office. Government offices, foreign embassies, major schools and oil companies are all in this island city, along with Port Zayed and the international airport and its famed shopping centre, Abu Dhabi Duty Free.